Hundreds of students filed into the auditorium on Friday morning, finding seats and chatting about which of their classmates had opted for the cafeteria study hall. But today is not about the pain, it is about the hope at the end of whatever tunnel you’re in. Ms. Morrisey stepped out on stage, and a hush fell. She gave a brief introduction, reminding students of of the stark reality that Shawnee County has lost 17 youths to suicide in the past year, and of the administrators and support systems that have been put in place for them, should they need it. She then introduced the speaker. A short video played, a preview of what is to come. 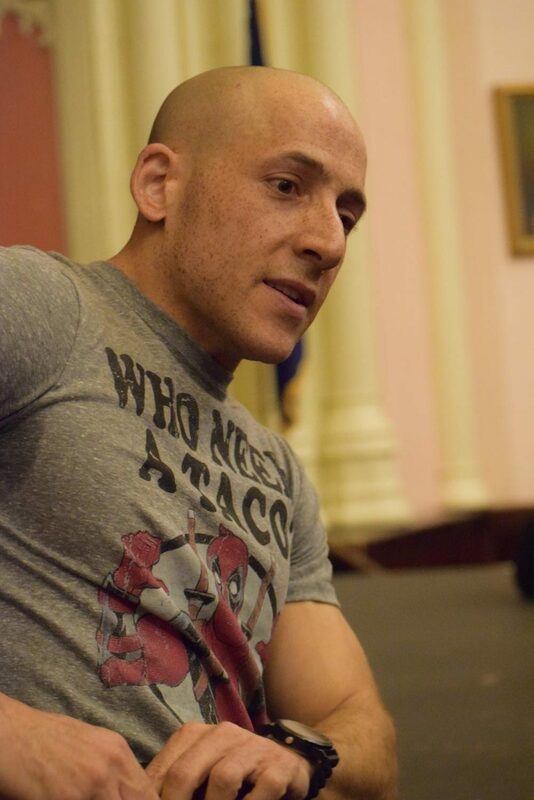 It told the audience a brief version of 37-year-old Kevin Hines’ story, about how at 19, he jumped off the Golden Gate Bridge- and survived to tell his story. To the side of the stage, Hines prepares. He breathed deeply. He removed his jacket. He picked up the microphone, then stepped out on stage. He asked the audience how it’s going until they collectively shouted, “Good!” back. And with that, Hines launched into his tale, how he had lost seven people important to him to suicide, about the pain he’s experienced since the day he was born, and about his own attempt. He asked for a moment of silence, to remember the people we have lost in our lives. The audience complied, and the auditorium was silent. Hines was left in the cold on an old mattress by his birth parents. He “bounced around” in foster care for years. He lost his only brother while in the system. They were supposed to be adopted together. Hines first noticed the voices, caused by infant trauma, in fourth grade. The voices not of those he loved or even knew, the voices that hated him. The voices he couldn’t help but start to believe. The voices he felt he could never tell anyone about. Hines was viciously bullied all through grade school. The eighth graders would call him the n-word and punch him in the stomach until he bruised. He was thrown into trash cans on multiple occasions. Again, despite his pain, he told no one. It wasn’t until he was 17 that that changed. While performing in his high school production of How to Succeed in Business Without Really Trying, Hines was seized by a terrible paranoia. Everyone in the packed auditorium wanted to kill him, and would storm the stage at any moment. Or at least that’s what the voices were saying. Terrified, Hines ran to the lobby, where he found the play’s director. After demanding an explanation only to get incoherent babble in reply, the director called Hines’ mother. She got him a psychiatrist. The psychiatrist was said to be the best in the business. Hines described him as always wearing a v-neck sweater with cuffed khakis, a man obsessed with repetition. It wouldn’t be until later that Hines would learn that the psychiatrist was, between helping people with their ills and struggles, ill himself. The entire time Hines was seeing him, the psychiatrist was battling a meth addiction. Hines was diagnosed with bipolar disorder. He took medication to treat it for two years. However, he was becoming increasingly desperate, increasingly depressed, and increasingly suicidal. On September 25, 2000, at age 19, he wrote down his last words to his family and got on a bus to the Golden Gate Bridge. The bus was packed. He was scared. The voices in his head were deafening, shouting that he needed to die. He broke down crying, screaming at the voices to stop. But no one on the bus did anything. Standing on the bridge, Hines wondered if anyone could tell what he was about to do. Then a woman approached him, smiling. Rather than offer help, however, she asked Hines to take her picture. He did, and then she left. He jumped. Hines plummeted the long 245 feet to the waters below. The whole time, he had one thing on his mind. He hit the water, hard, but he was alive. He couldn’t feel his legs. He couldn’t tell which way was up. He knew he didn’t have much time. But he was alive. As he struggled to stay above water, he noticed something circling him. The something, which he assumed was a shark, circled tighter and tighter, keeping him above water. He named the something Herbert. Herbert was actually a sea lion. Hines was rescued by the Coast Guard and taken to the hospital, where he learned that he had just barely managed to not sever his spinal cord. Hines learned a lot from becoming one of just 36 people to survive a suicide attempt from the Golden Gate Bridge, but one of the biggest lessons was to reach out. Hines had thought no one cared. His birth parents, the people on the bus, the woman who asked for a photo- they all left him.